Seven Stories Press, 9781609808082, 944pp. Here for the first time is the complete short fiction of one of the twentieth century's foremost imaginative geniuses. More than half of Vonnegut's output was short fiction, and never before has the world had occasion to wrestle with it all together. Organized thematically—"War," "Women," "Science," "Romance," "Work Ethic versus Fame and Fortune," "Behavior," "The Band Director" (those stories featuring Lincoln High's band director and nice guy George Hemholtz), and "Futuristic"—these ninety-eight stories were written from 1941 to 2007, and include those Vonnegut published in magazines and collected in Welcome to the Monkey House, Bagombo Snuff Box, and other books; here for the first time five previously unpublished stories; as well as a handful of others that were published online and read by few. During his lifetime Vonnegut published fewer than half of the stories he wrote, his agent telling him in 1958 upon the rejection of a particularly strong story, "Save it for the collection of your works which will be published someday when you become famous. Which may take a little time." 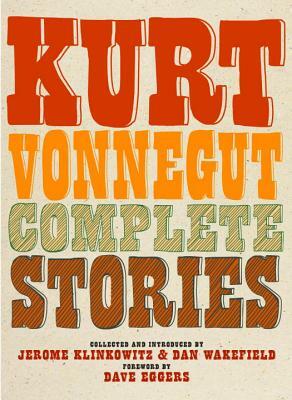 Selected and introduced by longtime Vonnegut friends and scholars Dan Wakefield and Jerome Klinkowitz, Complete Stories puts Vonnegut's great wit, humor, humanity, and artistry on full display. An extraordinary literary feast for new readers, Vonnegut fans, and scholars alike. Born in 1922 in Indianapolis, Indiana, KURT VONNEGUT was one of the few grandmasters of modern American letters. Called by the New York Times "the counterculture's novelist," his works guided a generation through the miasma of war and greed that was life in the US in the second half of the twentieth century. Vonnegut rose to prominence with the publication of Cat's Cradle in 1963. Several modern classics, including Slaughterhouse-Five, soon followed. And he wrote and published dozens of short stories. "Given who and what I am," he once said, "it has been presumptuous of me to write so well." Kurt Vonnegut died in New York in 2007. A longtime friend of Kurt Vonnegut's, DAN WAKEFIELD edited and introduced Kurt Vonnegut: Letters, and is the author of the memoirs New York in the Fifties and Returning: A Spiritual Journey, and the novel, Going All the Way, which was made into a movie starring Ben Affleck. He lives in Indianapolis, Indiana. JEROME KLINKOWITZ, a scholar of mid-century American literature in general and Kurt Vonnegut in particular, is a professor of English at the University of Northern Iowa. He is co-editor of The Vonnegut Statement and author of several books including The American 1960s. He lives in Cedar Falls, Iowa. DAVE EGGERS is the founder of McSweeney's and is the author of many books, including Heroes of the Frontier, The Circle, A Hologram for the King, and What Is the What.